When out in the wilderness it is always important to be prepared. An experienced outdoor enthusiast will ensure that they carry a well stocked bag of essentials with them at all times. One of the items of this ‘essentials kit’ is the best tactical flashlight. For a wilderness pursuit, one requires a sturdy, durable light, with excellent lasting power. Your tactical flashlight should be water resistant and acceptably light to carry. It should also have features which make it easy to access and to use in an emergency scenario. Whether you are a hunter or an avid conservationist, a policeman oFr a night time dog walker, a good, bright tactical flashlight is always an important safety measure. Some of the more compact and light weight lights are particularly useful even for placing at the bottom of a handbag, or for clipping to a helmet or a bike. Many campers and adventurers prefer to go hands free with a head torch, only to find that as the sun sets, the night time bugs come out to play, and, drawn by the light, make a direct aim for the head torch wearers face. Thus the head torch wearer often succumbs to facial bug bites, and at this point turns to a good hand held light instead. When picking a tactical flashlight for general outdoor use, always select for longevity. There is no point in having the brightest light on the block if it is likely to fail at any moment. Lumen is the measuring scale of the energy that a flashlight emits. Higher lumen means the higher intensity of the beam. You should look for a flashlight with higher lumens, which means it’s better to have 5000 lumens than 1000 lumens. Make sure to check the heating of the flashlight as high lumens are sometimes associated with heat. Size is an important factor while selecting a flashlight and if you are on a bag packing trip, the lighter flashlight is one great choice. The compact flashlight can be carried easily, as well as protected from water or any harm. Either it’s the lithium or conventional alkaline that gives energy to a flashlight. According to experts, it’s lithium that works consistently delivering a better performance. If you have a replaceable battery, make sure you charge them for time and replace as and when needed. The scattered light emitted from a flashlight is called the flood. Throw on the other hand is the light emitted from a particular point. Focus on the flexibility and source of light before you buy a flashlight. No matter what you intend to use your tool for; it is always a good idea to choose a light with an adequate level of water resistance. Finally, the best light for you will depend on what you want to use it for. A belt clipped light offers rapid access for those who may need to use their light in a hurry, whereas a compact light may be handier for walking the dog. Yes, the applications of tactical flashlights are vast, so don’t be put off if you are not a fire arms enthusiast. We will be discussing nine of the best tactical flashlights that are currently on the market by reviewing the features and durability of each product, and looking into their use in a variety of settings. Not too thrilled with shopping for tactical flashlights on your own? Well, lucky for you! We have compiled some of the best products that your money can get you. This Streamlight 750 Lumen Professional Flashlightight seems to tick every box for a good flashlight. 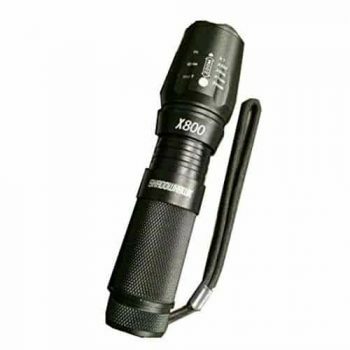 It is bright, durable and compact that has been used by policemen and security guards who depend heavily on the consistent functionality of their flashlight. This device receives great reviews in terms of durability. What’s really the best are the 750 lumens version is USB chargeable, negating the need for wasteful batteries. The lumen is likely to flood a large area with high intensity light with its C4 LED technology. The flashlight comes with three different operating modes, including high/strobe/low, high only, and low/high. With 50,000 hours of lifetime you get three types of light output: high, low, and medium. The streetlight proprietary battery is rechargeable and average battery life is taken to be 1.5 hours. Provided the flashlight is made for multiple purposes, you can easily use it one handedly. Considering the flashlight is meant for bag packers and camper, this flashlight is even waterproof and is being tested for one meter for approximately 30 minutes. Related: People who bought this product also buy the Simpeak Hand Crank Solar Flashlight. Just the way the name suggests, it is a solar rechargeable battery that can be used anywhere and anytime. The hand crank lights 8 minutes by cranking for one minute, and solar panels work under almost all conditions. For those who want to power up in the most eco friendly way, this is the right choice. Plus, you don’t have to carry any sort of plugging and charger with you, which is likely to keep all the chaos away. 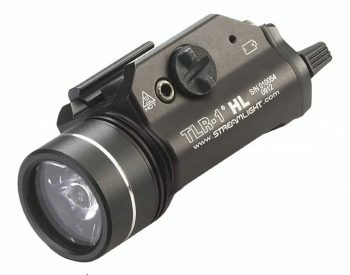 This Streamlight TLR-1 Flashlight is crafted for specific use with firearms, and boasts the ability to mount securely with a wide range of weapons. I have no experience with firearms, but users have reported that the light works perfectly in conjunction with hunting weapons. It has ambidextrous usage features, and has received excellent reports in terms of brightness; combining a “concentrated beam with optimum peripheral illumination”. Tightened interface and handed snap on keeps your hands away from the muzzle when detaching and attaching. 6000 series machined aircraft aluminum is given anodized finish and the glass lens is made shock proof to survive all the weather condition. Some users report that it can be tricky to use the strobe feature. I would also add that it uses lithium batteries, instead of having a charging feature. However, otherwise this seems to be an excellent device. If you are fine with the price and want a high performance flashlight, then go with this flashlight without any second thought. Related: People who buy this also prefer the Streamlight 85177 CR123A Lithium Batteries. This pack of 12 streamlight lithium CR1234 batteries works excellently for the Streamlight flashlights. These batteries can be used in photo equipment, cameras, and medical equipment. The shelf life of these batteries are nearly 10 years, hence you don’t have to worry about how long it is going to stay. Certainly among the cheaper of the lights reviewed today, this Vizeri LED Tactical Flashlight unsurprisingly achieves lower brightness and is of lower quality than some of the more premium examples. However, this little light has good beam quality for its compact size, and buyers report being happy with its brightness. It is quite durable, and has the nice feature of cycling through five different beam modes. The features of this torch creates bright intense beam that is brighter than any other light around you. 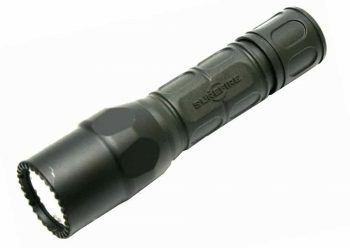 Five modes are attached to this flashlight – high, strobe, low, medium, and SOS. The body is made up of military grade aluminum, which is gold plated to fight corrosion. 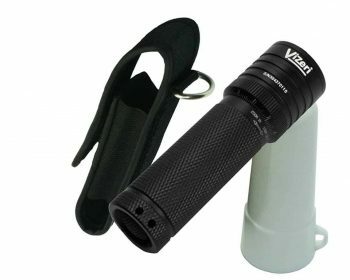 The Vizeri flashlight comes with a number of accessories to make the usage easier. You will receive it with a bike mount, weapons mount, remote tactical switch, lithium batteries, and orange diffuser. What we like the most about this flashlight that along with being waterproof it also gives full zooming option. This light might be best suited for use for camping trips, as the low beam mode is perfect for illuminating a tent, and it also comes with a carabineer to convert it easily into a hanging lamp. Related: People who buy this product also buy the Tangsfire 18650 3600mah Rechargeable. The rechargeable 18650 comes with IC protection and can charge 1 – 2 batteries simultaneously. You can charge your battery using this charger for over 500 times. Moreover, the charger is foldable to be carried around when you are traveling. This OxyLED OxyWild Flashlight is good value, and does what it needs to for the price. It features compatibility with rechargeable batteries, which make it a much more economical buy. The flashlight comes with three brightness levels, strobe and SOS functions. You can zoom the flashlight depending upon your need. Toughened, anti reflective coating, and clear glass lens makes the flashlight a durable and safe choice while traveling. You can use these flashlights even in heavy rain, so they are recommended when you are camping or fishing. However, it does not have as long a battery life as some of its competitors. The OxyLED is still an excellent choice for a compact, user friendly flashlight. What we like the most about the manufacturer is the after service they offer, you can simply rely on their products as well as the friendly customer service. Related: EBL Fast Battery Charger is one of the most often bought product with this flashlight. Charging in the flashlight itself can be a little problematic and that’s where the EBL fast battery charger comes in the picture. You are going to get a pack of four batteries with this charger. The charger provides protection additives to the cathode of batteries, increasing the lifespan by almost 1000 cycles. Provided it’s a cheap purchase, this one comes with lots of perks. Though the Shadowhawk X800 Tactical Flashlight falls in the lower end of our price range, reviewers claim that this particular torch is not good value for money. Complaints include some issues with the battery charging, and reports that sometimes the product does not come with instructions. However, with a good range of beam settings, a high light intensity and a rechargeable battery, this light certainly does have some great qualities. Given the manufacturing is sturdy and shock proof; it can be carried on your most adventurous trails also. This flashlight is likely to survive even the rainy weather because of its water resistant and hard ionized finish. Depending on your need, you can simply adjust the intensity of the boom. At such a low price, this flashlight is one of the best available in the market. Related: People who bought this product also buy the Poshei Portable Outdoor LED Lantern at some point. The lantern is capable enough to illuminate 360 degrees and covers up 400 squares, which is quite enough to illuminate a tent, boat, garage, and caravan. Magnet on the bottom can be used to attach the lantern to any sort of metallic surface. Being shock and water resistant, this emergency lantern is known for utmost quality. 100% customer satisfaction is guaranteed with this product. Advertising itself as a ‘military grade’ flashlight, this LumiTact Tactical G700 Flashlight seems to pack a punch. It is reasonably priced, highly durable and very bright. It is also compatible with rechargeable batteries, which is always a plus. However, some users have had issues with the usability of the rechargeable batteries, finding that they don’t hold charge. The best part about this flashlight is its front mounted striking bezel that acts strongly in self defense. You can simply immobilize the offender with this striking bezel. It is possible that this light is not quite the ‘military grade’ advertised, but would certainly do the trick as a secondary light source, or as a light to be kept in a regularly used bag. Related: People who buy this flashlight also buy the TAC-800 Flashlight Kit. The kit is everything that you need to have during your wild camping and trekking trip. The package comes with a high power light, a lithium ion rechargeable battery, universal WALL charge base, and a protective storage case. The kit is constructed after keeping in mind the adrenaline junkies. So, get it without any second thought. 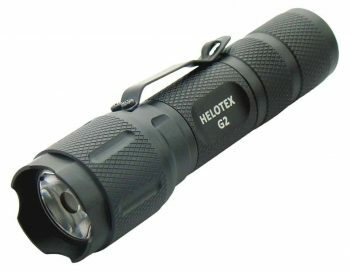 Users of the Helotex G2 CREE Flashlight report that it has an excellent light quality with a well balanced beam. It is lauded as compact and very durable, and worth more than its modest price. The flashlight works either on a CR 123 battery or a single AA. Once you have switched it on, you can toggle it in between high, low, and strobe function. It is neat and compact and so it can be affixed to helmets or to hard hats if required. It may not be the brightest light on the market, but its durability and good beam quality make up for that. 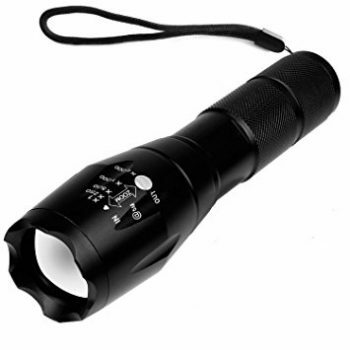 The flashlight works well for tools, cars, houselights, and as a backup light of unarmed guards and security officers. Width of the barrel is decent and it even feels sturdy. Most likely it is going to suit all sorts of hands and is almost going to be best for slender hands. At such a low price, this is one of the best flashlights you can have. Related: People who buy this product also buy the Lumi Tact Mini G700 Tactical Flashlight. Giving 450 lumens, this flashlight is recommended for most of the outdoor tasks. You will receive it with three power modes – high, low, and strobe, AA rechargeable batteries, and a wall charger. At such a low price this one is one of the best pick you can have in access. 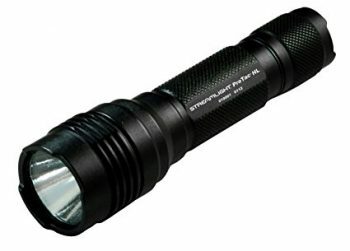 This SureFire G2X Flashlight is widely acclaimed as being highly durable. Its compact design and durability make it feasible to use it in conjunction with firearms. It has been praised as remaining reliable even after long term use as a gun mounted light. Notably also, this product comes in a variety of colors, hence you can find one that suits your choice. I say this not just from a fashion perspective – it also makes it easier to identify your own flashlight if you often find yourself in a situation where several of your colleagues or friends have a similar light to yours. Virtual indestructible LED emitter regulates maximum light output and runtime. Tough Nitrolon body with anodized aluminum bezel puts maximum resistant impact on the body of the flashlight. Related: People who bought this product also buy the Hartech H7 Tactical Mini Flashlight at some point in the life. Powered by CREE Q5 LED Technology, this Palm Sized flashlight works miraculously well for indoor as well as outdoor use. You can simply buy it for outdoors, self defense, and emergency purpose as it works in three different modes high, low, and strobe. There is a thumbscrew lock on the tailcap which doubles as a tripod connector. This product has a power indicator built into the on/off switch, which allows a visualization of the remaining battery power. It comes supplied with a Velcro belt holster and car charger. 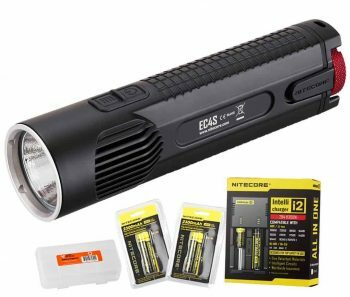 This Nitecore EC4S Flashlight is one of the more expensive tactical flashlights on the market, but many people will argue that it is well worth the extra money. It is certainly the most versatile light in our review group, boasting 5 different brightness settings and three special settings, including a location beacon. It is described as extremely bright and users are happy with the beam quality. It comes with a charger, negating the needless expense and even more needless waste of disposable batteries, and has the added feature of a power indicator built into the on/off switch which indicates the light’s remaining level of battery life. This is obviously a very handy feature, as the last thing you want is for your light to be running low on battery unbeknownst to you as you head out into the wilderness. Finally, the light has a belt holster for ease of use. If you are willing to go the extra mile in terms of expenditure, this could be an excellent light for you. Related: NiteCore Tube Keychain flashlight is one product that you can buy with this flashlight. High performance LED delivers 45 lumen that features two brightness levels. With one recharge, the battery can work for almost 48 hours. Constructed with lightweight PC materials, this flashlight is finger friendly as well as affordable. Thus concludes our review of nine of the best tactical flashlights that are currently on the market. Whatever you use your light for; do not use it to scare or to disturb animals unnecessarily, or to hunt in a non sustainable fashion. Please use it in conjunction with respect for our planet and for nature. Do you have a specific flashlight that you prefer over others? What do you look for in a tactical flashlight?